I love this quote because it's filled with possibilities. I love to coach - and I love to help clients have fun while I do it. I know, sometimes it sounds hokey. But sometimes hokey stuff is still true. I’m a firm believer that it’s never too late because life keeps happening and we keep evolving. And nowhere is this quote more evident than when it comes to fitness. It doesn’t matter if you never liked gym class. I actually skipped so many classes my senior year to avoid swimming that I nearly failed. (True story). And it doesn’t matter if you’ve been told that you can’t walk and chew gum at the same time. It’s never to late to get started. And I want to help you do just that. Whether your goal is to lose weight, gain strength, or just flat out move better, I can help you. And I promise you, if you have an open mind and a willingness to be coached, good things will happen. And we’ll have fun in the process because I’m a big fan of fun. I’m located in Topsham, Maine, which is 30 minutes North of Portland. 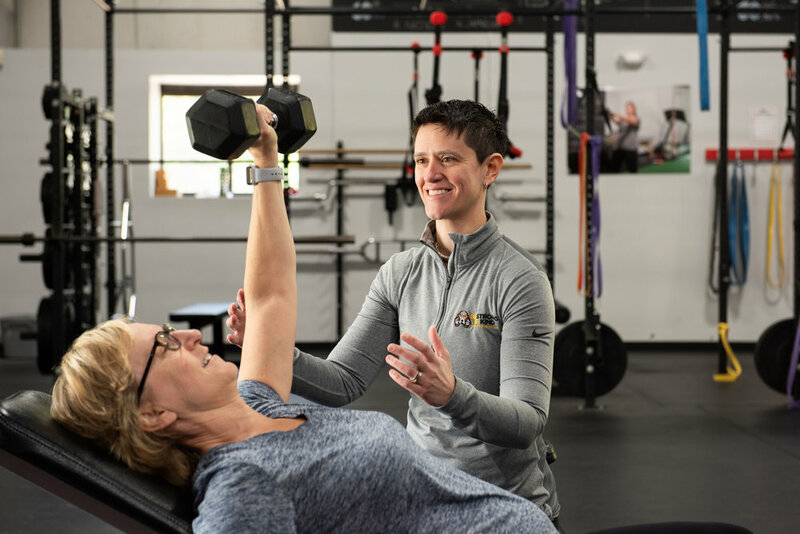 I do my training out of New England Medical Fitness in Topsham and I’m available for one on one sessions multiple times a week. Ideally, we only need to meet for a few months before you have the knowledge and confidence to work out on your own. Workouts are totally funner with friends. So much funner that I feel like we can just call things funner. If you have a small group of two or three friends you’d like to bring along, no problem. Not in Coastal Maine? No worries. I work with clients from all over the country and would be happy to help you with programming and technique. You’ll fill out a health questionnaire so that we can customize a workout to you and your needs. We’ll either do an in-person or skype session that includes a Functional Movement Screen and, if we meet in-person, I'll put you through a mini-workout. Four to 16 weeks of custom programming to get you where you want to go. I’ve spent 15 years working as a photographer for newspapers, colleges, and websites. Most recently, I’ve put a focus on fitness photography, snapping pics for the websites of Tony Bonvechio, Tony Gentilcore, Cressey Sports Performance, and more. My speciality is in sports photography and I was the team photographer for both the Altoona Curve and the State College Spikes in 2006. If you’re a fitness professional who would like some new shots for a website, or if you would just like to document the incredible progress you’ve made, then I’d love to provide you with some photographs. For a full portfolio of my work, please click the Flickr icon to the right. If you would like to work with me for training, photos, or both, please send me an email at Kim@kimlloydfitness.com.